Tonight the first albedo features spotted were Mare Sabaeus and Sinus Meridiani. The slight kink at Edom was visible. S. Meridiani and S. Sabaeus show a darker albedo than the Iapigia and Mare Serpentis regions. Deucalionis region was also slightly visible. The next most prominent feature was Syrtis Major, with a pointed tip and its ‘triangular’ darker albedo next to a lighter region connecting to Mare Tyrrhenium. The extended tip of Boreosyrtis extending from Ortygia was slightly evident. Extending from Utopia at around 20 degrees a subtle feature was evident which corresponds to Mare Acidalium. While observing, I was not so sure whether to sketch this due to its low contrast. However, official Mars maps show its correct positioning as that of M. Acidalium. The polar cap was very evident. Observation of Mars through blue filter (#38A) showed the presence of the lighter polar cap, as well as the lighter Arabia region and along the limb. Very nice work and a good match to the simulation. It looks good, but really the contrast was so high in eyepiece? 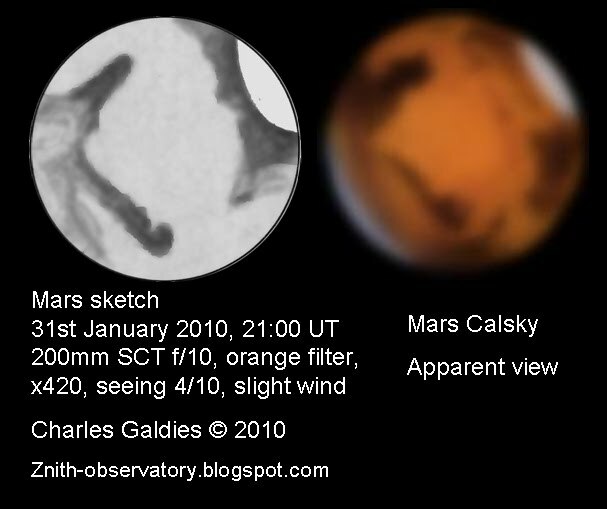 Great Work Charles I love to see visual observers sketches compared with CCD images. You have done well and very honestly too.